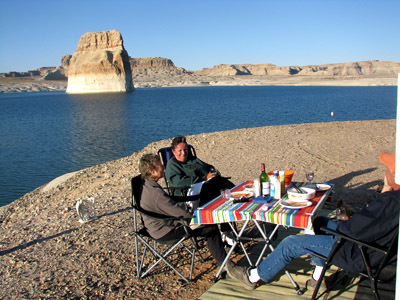 Page, Arizona is the hub of a wheel called the Grand Circle - an area that includes the National Parks and Monuments that dot the varied terrain of northern Arizona and southern Utah and Colorado.We won't be able to see it all on this trip. We've just entered Utah - our final state to explore on this five-month trip. By the end of May, we will be back home in Ontario. Choosing what to see and what to miss in the Grand Circle has caused considerable stress. We tried to estimate how much time to allow for each area we want to explore. In the end, we had to concede there isn't enough time and decided to make "new" experiences a priority. We'll stop only briefly at locations we've visited before. But that is SO DIFFICULT to do in our favorite state. Invariably, we spend twice as long as anticipated at most stops or add an unplanned must-do hike. Our first stop was intended to be just a quick touchdown. 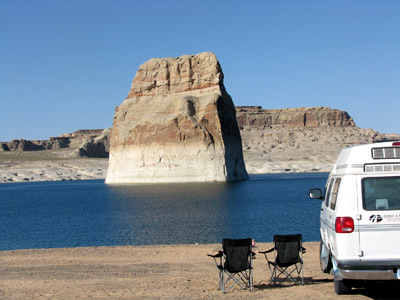 We've camped at Lake Powel's Lone Rock Beach several times. Before our quick lunch was made, someone called out Randy's name - recognizing his "distinctive style" I guess, from my blog photos. We had met new friends. With pretty scenery AND a dinner invitation, how could we resist the temptation to stay on? We meet a lot of great people on the road but, once in a while, we recognize a special connection. Such was the case with Bruce and Sheila. We just clicked. 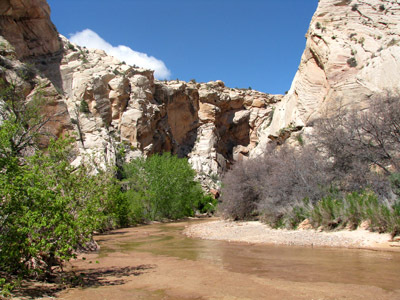 Reluctantly, we did move on into the lower Escalante the next day and stuck to our promise to do hikes that were new to us. We followed a cow path to this area marked on the park map simply as "White Rocks" (a point of interest). 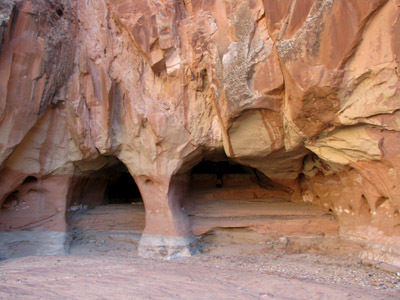 And along the Paria Box as far as these caves. This hike required several river crossings and Randy, whose boots aren't as water-tight as mine, tried some creative "trail building". We love scrambling off-trail on slickrock and had plenty of opportunity for it. 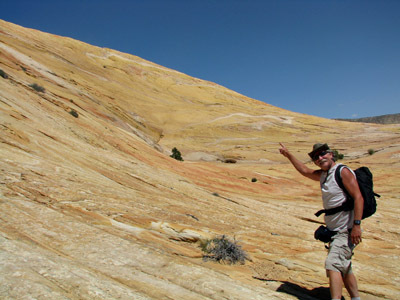 Randy wanted to climb a giant gold rock we had passed on our drive to Hackberry Canyon. 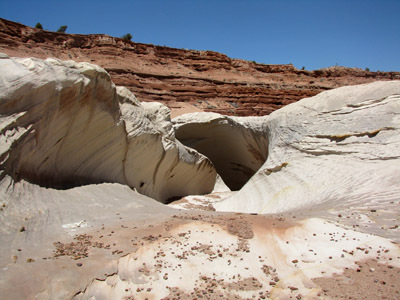 We encountered some Swiss hikers who told us we could climb up to that rock from the Paria Box so we stayed in the area a day longer than planned to do what ended up being the longest hike of our trip. We have no idea how long this trail was - it's not on the official maps and a ranger we talked to later didn't even know about it - but we estimate the round-trip was over nine miles. Randy climbed to the top but, by then, I was too bushed to even attempt it. I needed all my reserve energy for the return trip. 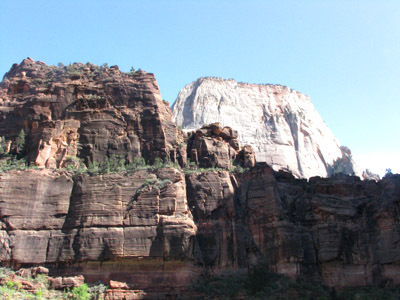 The next day, in Kanab, we found out there is a much shorter route to the top of what they call, Yellow Rock. In fact, we had actually been parked at the trailhead two days ago and didn't even know it. Arrrgh! I know, I know ... you're saying, "Enough with the pictures of rocks already, or I'm going to stop following this blog!" 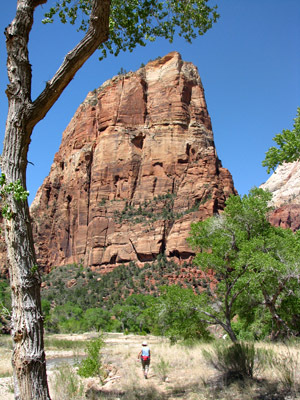 You'll be glad we only spent one day in Zion National Park. This is, however, the park with the most majestic of all rocks. Just two photos - indulge me, please? 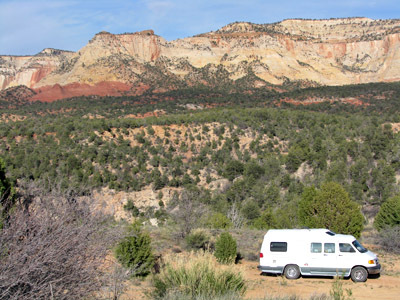 Once again, we camped in amazing, scenic, free locations, including this familiar one, near Zion. Do you recognize it? 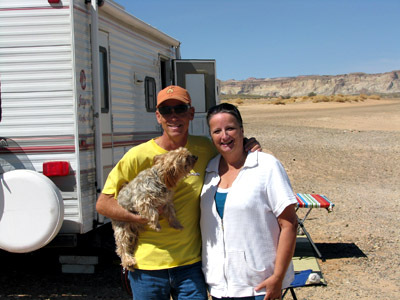 This is the same free boondocking campsite that made it into The New York Times. 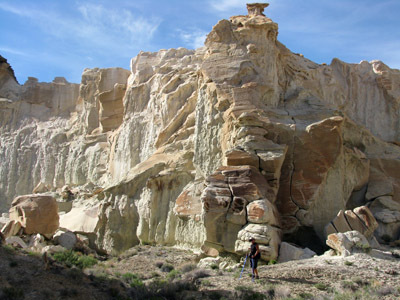 Continuing on the Grand Circle route, our adventure trail eases north and east. With less than a month until we head home, there are still so many stops we want to make. Can we get them all in?